Justice Society of America founder Johnny Thunder was the master of the thunderbolt genie Yz. However, in his later years when his mind started to deteriorate, Thunder began to lose control of his servant so he stored him in a pen. But as his mind became even worse, he misplaced the pen which was picked up by his friend the Flash who passed it along to a young man named Jakeem Williams. Never knowing his father and losing his mother at a young age, Williams lives with his aunt and discovered the pen’s secret when the world was threatened by another thunderbolt genie where he helped the surviving members of the Society in their battle. When the super hero group reformed, he joined as the hero JJ (for Jakeem Johnny) Thunder and became close friends with the new Star-Spangled Kid (known better today as Stargirl). When Black Lightning’s daughter Lightning joined the Society, Williams developed a crush on her that she did not reciprocate. A live action Stargirl series was just announced at San Diego Comic-Con International for the DC Universe service which will include the Justice Society. This brings into question if JJ Thunder will be available for Black Lightning. Frequently associated with Black Lightning by fans who don’t read the comics, Static is Virgil Hawkins of Dakota City. A geeky high school student, Hawkins was caught in a crossfire between two gangs and doused in an experimental mutagen gas that gave him the power to manipulate electricity. 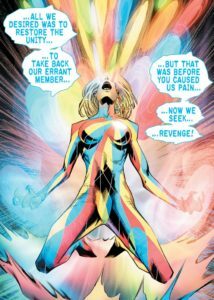 The event referred to as the Big Bang, dozens of people, mostly gang members, gained powers (referred to as “Bang Babies”) and Hawkins adopted the identity of Static to combat them. Static became the breakout star of the comic company Milestone and was adapted for television in the DC Animated Universe. 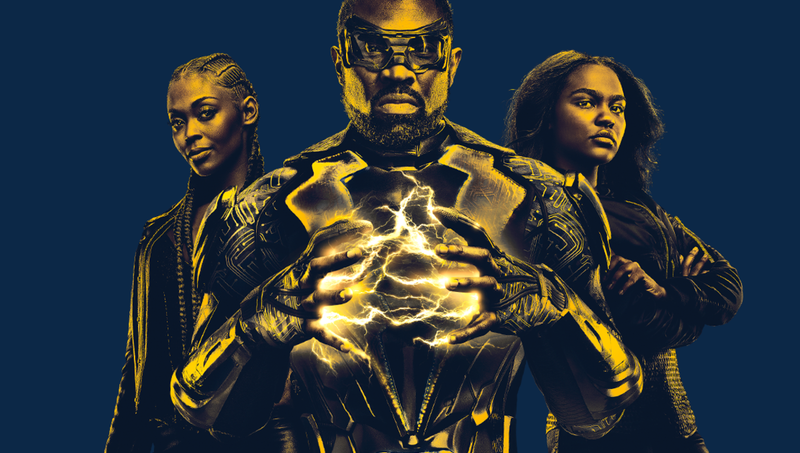 Plans have been in place for four years to adapt Static as a live action television series that has lingered in limbo for the past three years. 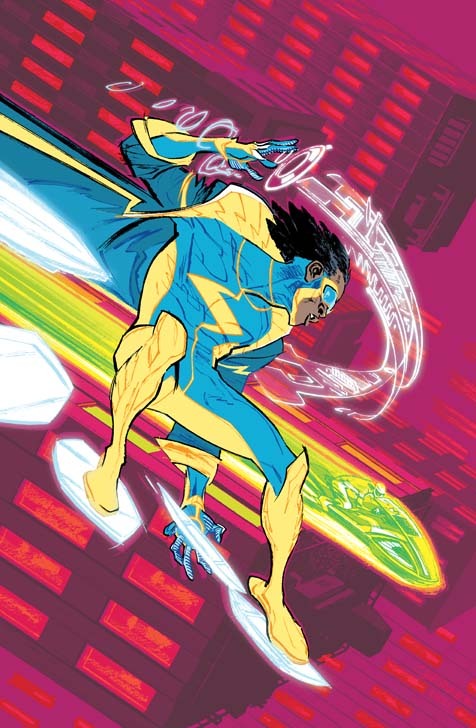 Given the similarities between Black Lightning and Static (so far as the former becoming the latter’s mentor in the series Young Justice) and the perceived connection between the two (there’s a popular misconception that they’re father and son), pairing the two in the series could be an ideal turn for Static. 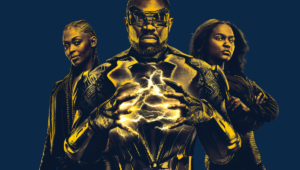 Further, elements of Black Lightning including the event that gave the eponymous hero and others powers in the past and the current storyline with the drug “Green Light” mirror aspects of Milestone’s Big Bang. 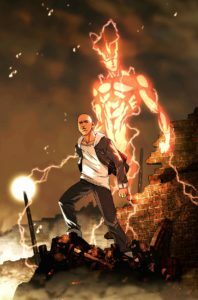 The introduction of Static could establish aspects of the Dakotaverse in the series, perhaps even bringing in villains like Holocaust, Rubber-Band Man, Ebon and the Meta-Breed, Star Chamber, and Capers, Inc and heroes like Icon and Rocket, Hardware, Blood Syndicate, and the Shadow Cabinet. The only real issue that could arise from this is that since Milestone merged with DC Comics, Static has largely been a Titans character so that series might have him shored up. 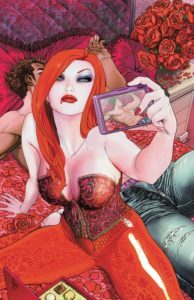 A bank teller, house wife, and friend of Outsiders member Katana living in Gotham City, Emily Briggs’ life was turned upside down when she was kidnapped by an underground civilization called Abyssia. Learning she was the last living descendant of their divine-heritage royal family, Briggs underwent a transformation initiated by Abyssia’s leader Tamira and the passing of Halley’s Comet. Her body turned into a more traditional concept of beauty and now wielding remarkable psionic abilities, the Outsiders unsuccessfully mount a rescue for Briggs but she instead is forced to nearly kill Tamira in order for her and the super hero team to be able to escape. Taking the name Lia (her father’s nickname for her), Briggs is reunited with her husband but her changes create unrest in their marriage. Soon after, the Outsiders are captured by the Masters of Disaster and Briggs rescued them. This turn of events lead her to separate from her husband and join the Outsiders as Looker. In her civilian identity, Briggs became a model obsessed with her newfound beauty which soured her relationship with Katana as she instead became close friends with fellow teammate Halo (which further annoyed Katana who was Halo’s legal guardian). Looker started to become a distraction on the team by becoming the mistress of teammate Geo-Force and rival of the Outsiders newest member Windfall (a former enemy and member of the Masters of Disaster). Eventually, she heeded a call for help from Abyssia where she reverted back to her former self leading her to return to her husband and old life. However, when Geo-Force’s homeland was overrun by vampires, Briggs regained her powers to aid him only to be turned into a vampire herself and slave to their leader Roderick. Geo-Force slew Roderick but Briggs remained a vampire leading to her divorcing her husband and re-joining the Outsiders. But, she would later retire and become the co-host of a talk show called The Scene with Vicki Vale, Tawny Young, and Linda Park. When a new Outsiders was formed as part of Batman, Incorporated, Looker seemingly died via a terrorist attack executed by Talia only to turn up alive again with the others later. A new version emerged parallel to the past version in model Emily Briggs being turned into a vampire and, as she can no longer be photographed, forms a model agency called LOOKER. A founder of the Outsiders, Halo was a mysterious character whose different colored auras manifested as separate powers. It eventually came to light she was Violet Harper, a thief and victim of Tobias Whale’s enforcer Syonide whose corpse inadvertently became the host to an unnamed alien being of the Aurakle species while on the run in Europe. Struck with amnesia, Halo stumbled into Batman’s conflict in Markovia where she joined his super team as she tried to uncover her past. Adopting the name Gabrielle Doe, Halo enrolled into high school and moved in with Katana (who became her legal guardian) in Bruce Wayne’s former penthouse in Gotham City (which became the home base for their group). The heroine also started a brief romance with team member Geo-Force who enrolled into college. In the interim, Batman hired private detective Jason Bard to investigate her past where he uncovered she hailed from Arlington, MO leading Halo to return to her parents. This lead to Halo having dreams about the Aurakles as well as Whale learning of her return from the grave where Syonide murdered Harper’s parents. Halo subsequently learned the truth of her origins leading her to leave the team and become a prisoner of the terrorist organization Kobra. The Outsiders managed to rescue her as the team took on a new member in Looker who became Halo’s best friend. Later, Harper’s consciousness started to manifest leading to her using Halo to turn on the team. Harper’s mind eventually separated from Halo to inhabit the body of another becoming the supervillain Spectra. Post-Flashpoint, Halo was a drug addict and test subject of Kobra where she became the host to a group of Aurakles. All but one of the Aurakle escape her body where the remaining one was permanently bonded and in control of the body. Taking the name Halo, Katana adopted her as her sister and guide to the physical world. 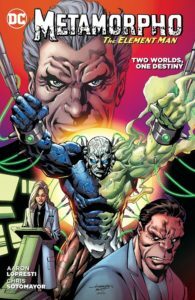 Arguably the second most popular founding member of the Outsiders (after Batman), in a different world, Metamorpho the Element Man would be a more well known property. In the late 1960s, American animation studio Filmation was awarded a license to produce animated series based on certain DC Comics’ properties. They produced The New Adventures of Superman, The Adventures of Superboy, and The Superman/Aquaman Hour of Adventure (which also featured shorts for Teen Titans, Justice League of America, Flash, Atom, Green Lantern, and Hawkman) which only became more popular with each passing year (Aquaman performed so well, he separated from his pairing with Superman for his own series). Filmation had plans on numerous DC properties including Plastic Man, Blackhawks, and B’wana Beast but their next big series was going to be Metamorpho. A pilot for the show was produced (faithfully adapting his first appearance with help from the actual comic writers) and work was being done on the series when Filmation was offered something they couldn’t resist: Batman. When the Batman television series ended in 1968, the TV rights were available and Filmation secured them. In order to get the show on the air by year’s end, they had to indefinitely delay Metamorpho to produce The Adventures of Batman. New episodes of Filmation’s Aquaman and Batman were produced up to 1970 where they ran in re-runs as the studio introduced Wonder Woman in the series The Brady Kids in 1972 in order to gauge interest for her own series. That same year, Hanna-Barbera pulled a similar tactic with Batman in The New Scooby-Doo Movies leading to their license to produce Super Friends in 1973. A war of sorts started between Filmation and Hanna-Barbera to make adaptations of DC’s properties where Metamorpho was lost in the shuffle. The closest the world ever came to Metamorpho’s animated series was the release of its theme song in 1968 by Peter Pan’s Tifton Records label. Instead, the character of Firestorm the Nuclear Man, which bore a number of similarities to Metamorpho, came to be in 1978 who joined the Justice League in 1980 (Metamorpho declined in 1966, seeming himself as a freak and wishing to be cured) and joined the Super Friends in 1984 to sell Kenner’s Super Powers toyline (which included a Firestorm action figure). The character gained quite a bit of fame and became a prominent component of the Arrowverse (where many of his villains made the transition as well). Metamorpho was the concept that died before being given a chance to shine. However, Black Lightning could change that. A mercenary and adventurer, Rex Mason was employed by ruthless businessman and brilliant scientist Simon Stagg. When Stagg learned Mason was having a romantic relationship with his beloved daughter Sapphire, he sent his employee on a mission to secure a meteorite called the Orb of Ra in Egypt. Following his success, Simon’s enforcer Java (a thawed-out caveman in love with Sapphire himself) knocked him out with plans to murder and dispose of him later. 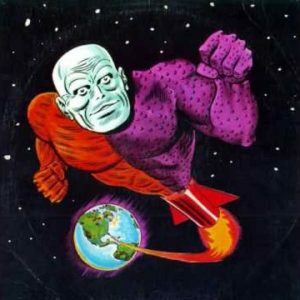 However, Mason is exposed to the radioactive energies of the Orb and is transformed into the freakish and powerful Metamorpho the Element Man. Appearing as something of a multi-colored Frankenstein’s Monster, Mason gained the ability to turn into any element. Mason returned to America to seek revenge on Simon only to be stopped by the villain’s possession of the Orb which causes pain to the mercenary. Simon promised to restore Mason to his former self as Sapphire convinced him of the good he could do with his newfound gifts. Simon, however, had no plans to cure Mason but instead manipulate him into being his super-powered slave. Mason went on to encounter a series of metamorphs like him in Edifice K. Bulwark (created by Simon when Mason left him), Element Girl (a US spy who transformed to become a super agent), and Algon (Roman centurion and the first Element Man). After several attempts to find a cure, Mason ended up in Markovia in hopes Dr. Helga Jace could help him but he ended up as a founding member of the Outsiders (alongside Black Lightning who also refused League membership). Subsequently, Mason ended up joining the League where he learned he had a son with Sapphire in Joey Mason and he started a romantic relationship with teammate Crimson Fox. Mason seemingly died saving the lives of his League’s members only to be returned to life by the Orb of Ra where he briefly joined the Doom Patrol. At some point, a piece of Mason’s body that was discarded grew into another Metamorpho and joined the Outsiders. When Mason learned of his existence, he tried to re-assimilate him but ultimately let him be where his “twin” assumed the name Shift. Later, Shift was forced to murder his lover and teammate Indigo leading to his re-assimilation with Mason when he couldn’t deal with the guilt. Mason returned to the Outsiders where he was seemingly assassinated by Talia only to have saved his teammates and himself. Subsequently, an experiment by Simon creates a bond between Mason, Plastic Man, Mr. Terrific, and Phantom Girl leading to their becoming a team called the Terrifics. Simon Stagg appeared on the Flash where he was killed by Eobard Thawne but his fate following Flashpoint has been left unknown. This entry was posted in Comics and tagged Arrowverse, Black Lightning, DC Television Universe, Jerry Whitworth, The Outsiders. Bookmark the permalink.